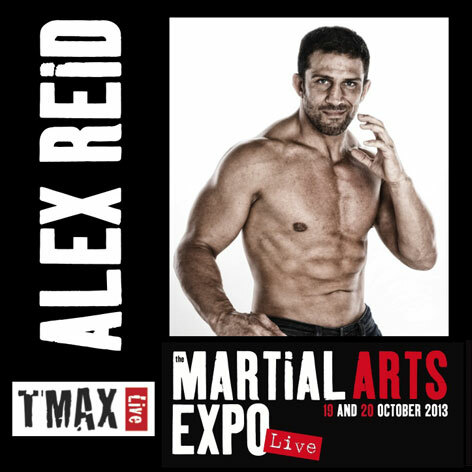 Alex Reid has two personas. The public persona as most know him, through the media as a cross dressing mixed martial artist who has had two very public relationships. He was married to Katie Price, media personality, reality TV star, former glamour model, business woman and mum of 4. His ex-partner Chantelle Houghton is also a model and realty TV star and the mum to Alex’s daughter, Dolly. In the days up to the interview at TMAX there was much talk in the press about Alex’s relationships including an exclusive in The Sun newspaper on the day of the interview. The personal persona I understand of Alex from those that know him, is one of a big hearted caring soul who would do the best he could for those in his life. He seeks to use his life experience and contacts to help others. I wanted to understand why there where such conflicting views of one person and which one was right. He spoke to me candidly about his martial arts, how he is viewed, what he wants from life and the things that didn’t go to plan. He tells of how he was bullied and was a bully, how he can’t trust people, what martial arts did for his life, his acting and alter egos. He also speaks about Katie and Chantelle. Judge for yourself which persona is right, the public or the private. All rights are reserved. Materials are not allowed for reproduction in any medium without prior permission.